The bands rocked hard, the crowds went wild, but best of all, it didn't rain. 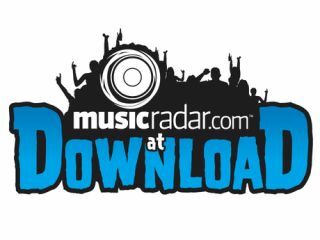 2009 was a vintage year for Download and MusicRadar, Rhythm and Total Guitar magazine were there to capture the sounds, sights and smells in words and on camera. Next page: Camera... check. Carpark pass... check. We've got a video camera and we're not afraid to use it. That vehicle pass will come in handy too. By lunchtime on Friday the celebs are out in force. Korn present a united front at their press conference. Former GN'R and still Velvet Revolver bassist Duff McKagan flies solo. Billy Talent's Aaron Solowoniuk, fresh from talking on camera to Rhythm magazine. The Blackout's Gareth Lawrence reclines on the couch with Rhythm. Check out the video interview. Wes Borland's main squeeze pays Total Guitar magazine a visit shortly before Limp Bizkit take to the stage. Chris Barnes from Rhythm magazine meets legendary Mötley Crüe sticksman - and swordsman - Tommy Lee. The Crüe draw a big crowd on Friday night and promise to come back next year. It's Saturday morning and Omar from Fightstar is eating Rhythm for breakfast. Def Leppard legend Phil Collen pays Total Guitar a visit. A bleary-eyed You Me At Six hang on to Total Guitar for dear life. Tempers fray in the press area. Burlesque dancers: an integral part of any festival. After an awesome, career-spanning live set, Chris Cornell stops by to talk songwriting with Total Guitar. Check out the exclusive behind-the-scenes video. The food at the hotel was so good we ordered a pizza. Steel Panther get their guns out for Sunday's busiest press conference. Keith from Buckcherry gets his riffs out for Total Guitar. Download: it's just one big village. TG, Rhythm and MusicRadar take time out from interviewing and filming to pose for the camera. Look at how lush we are. For much more from Download 2009, check out Total Guitar issue 192, onsale 12 August, and Rhythm's Tommy Lee/Wildest Drummers Ever issue, onsale 7 July.